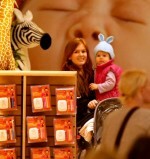 Isla Fisher was spotted toy shopping at FAO Schwarz with her daughter Olive in New York City. The pair are in NYC while Isla promotes her new movie Confession of a Shopaholic. Isla looked to be having a blast introducing her little lady to the New York Institution. The toddler was absolutely adorable in a blue rabbit eared hat while wearing a hot pink vest!